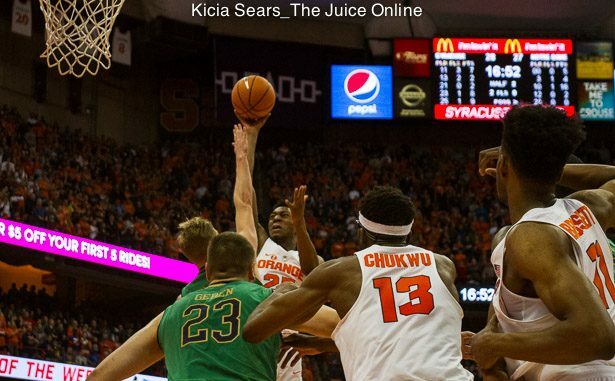 Syracuse guard Tyus Battle shoots during the second half of the Orange's game against Notre Dame. MANDATORY PHOTO CREDIT: Kicia Sears, The Juice Online. Adam Zagoria from ZagsBlog.com and the New York Times calls in to give updates on the Class of 2019 with Wes Cheng on The Juice on the Cuse Podcast hosted by SNY.tv. Wes also breaks down Syracuse’s tough loss to Virginia on Tuesday. Wes Cheng: Adam, let’s about Precious Achiuwa. Syracuse recently offered the 2019 wing, and he seems to be one of the elite prospects in his class. Where is he with his recruitment? Adam Zagoria: I saw him over the weekend. Roy Williams, Huebert Davis showed up courtside after losing two North Carolina games, Roy Williams told me he’s looking to get some new players. Precious who is about 6’9″ went out and had 19 points, 10 rebounds, four assists, four blocks. He had a couple of dunks right in front of Roy Williams. He had a 3. He was dishing the ball. Scoring. He had an all-around game. He just looks like a prototypical pro wing. Long. 6’9″. He’s got long arms. He’s multi-dimensional. He can score in multiple levels. He’s got to work on his consistency. He’s not really focusing too much on recruiting right now. I would imagine that North Carolina, Syracuse, and those type of schools will be in the mix. 2. Tyus Battle leaving after this season? 4. What is Syracuse getting with Jalen Carey? 6. Where is Kahlil Whitney with his recruiting?